This statistic illustrates the share of online ordered downloads of individuals from the Netherlands in 2017, by employment status. 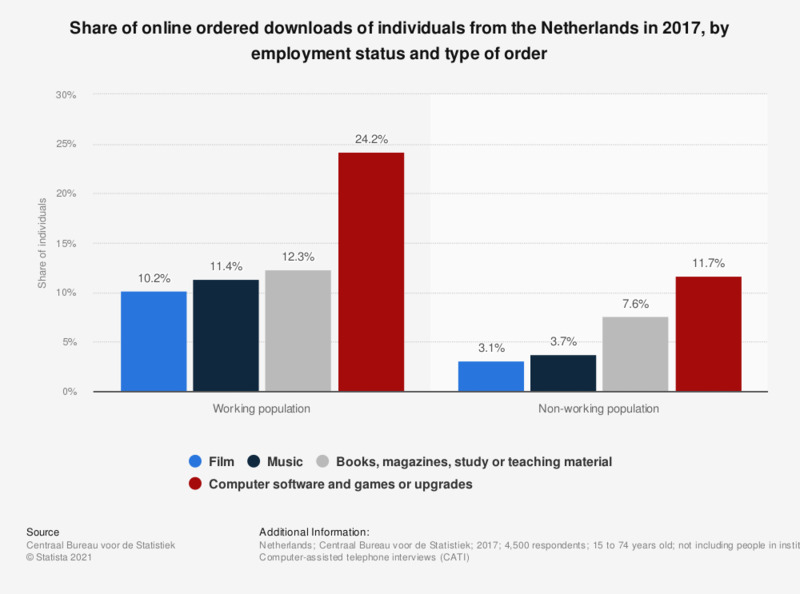 As of 2017, roughly four percent of Dutch respondents who were unemployed had purchased music on the internet which was delivered via a website or by a download rather than by regular mail. Original survey question: "Which of the following goods that you ordered via the Internet, were delivered via a website or through a download instead of per regular mail? Films. Music. (Electronic) books, magazines, newspapers and/or study or teaching material. Software for computers, including computer- or video games and software/games -upgrades." The source explains: "Online purchases are goods that have been purchased via an internet browser or an app. Goods that were bought via SMS, MMS or email are not included as online purchases." Working population defined by source as: "respondents of 15 years and older with paid employment of at least one hour." Non-working population is defined as: "respondents of 15 years and older without paid employment". Moreover, the source adds that 12 to 15 year olds are not included in the questions about employment.